According to 2015 data compiled by the National Alliance for Caregiving and the AARP, an approximate 43.5 million people had provided unpaid, caregiving to family members in the last 12 months alone. It’s a staggering figure and one that reveals the need for education, advocacy, and support for the informal caregivers in the U.S. These attendants most often perform vital tasks, such as shopping, food preparation, laundry, feeding, dressing, grooming, bathing, physician visit coordination, medication administration, and much more. Perhaps unsurprisingly, this type of work can put a considerable amount of mental and physical stress on the unpaid, informal caregiver, which is why education and connection with experts is so important for all parties involved. Fortunately, there are many caregiver-centric conferences held each year that focus on empowering and coaching caregivers. 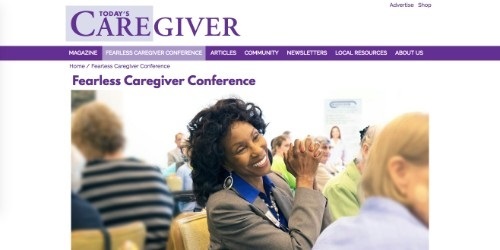 From learning how to be a better advocate to navigating appointments with healthcare providers, learning how to cope with a difficult diagnosis, establishing a care team, discovering the latest innovations in managing specific diseases, and more, these events provide a wealth of information for today’s caregivers. What’s more, they offer a sense of community and support, giving caregivers a valuable lifeline and the knowledge that they’re not in this alone. If you’re thinking about attending a caregiving conference this year, we’ve rounded up a list of 51 of the best conferences in the U.S. and around the world for 2019. Below, you will find each event listed by category, quarter, and date. Taking place on the campus of Boise State University, the 8th Annual Family Caregiver Conference is a one-day event that teaches and reinforces the necessary steps that all family caregivers should know, from basic healthcare practices to caregiver mental and physical health. This event is organized by Jannus, a not-for-profit health and human services organization, serving the greater Boise area. The aptly-titled Fearless Caregiver conference is an event that aims to empower caregivers caring for patients and family members in a range of different health scenarios. The Q&A-based event is facilitated by home healthcare specialists, working in both familial and professional positions. Can’t make the Rivera Beach event? Consider attending the conference in Boynton Beach, Ocala, The Villages, or West Broward in the spring. Since 2001, Keiro’s Caregiver Conference has been the choice of Japanese-American families providing home care to their elders. Included in the day-long conference is a series of seminars, a resource fair, professional consultations, health screenings, and much more. For caregiver mental health help, be sure to attend the opening keynote, Iyashi Care Panel: Family Dynamics, hosted by Keiro’s program and innovation manager, Kevin Oshini. Hosted by the American Society on Aging, Aging in America 2019 Conference bills itself as an event that is the “place to be for knowledge, inspiration and networking with others who are dedicated to improving the lives of older adults.” This year’s New Orleans-based edition will include keynotes and breakout sessions on topics such as emergency preparedness, transportation access, home healthcare, family caregiving, and substance abuse. For 50% off the ticket price, register as a one-day volunteer. Geriatrics: Your Future is Now 2019 is a one-day event that aims to provide home healthcare workers and family caregivers with the latest developments in aging and quality of life protocol improvements. For an even fuller experience, attend the exhibition, an event that is included in the registration price which gives caregivers cutting-edge homecare products and services. Age + Action, a conference made possible by the National Council on Aging, is set to welcome 800 professionals and family caregivers, including those affiliated with the National Institute of Senior Centers, the Center for Healthy Aging, and all Benefit Enrollment centers, countrywide. This year’s conference will tackle a range of hot topics, including women’s aging issues, economic security for seniors, and more. Age + Action will be held at the Renaissance Washington, DC Downtown Hotel. This summer, the National Association of Area Agencies on Aging will host its 44th Annual n4a National Conference and Trade Show, a 5-day event that brings together a wide range of medical professionals, advocates, and family caregivers. This year’s conference is scheduled to the brim with workshops, keynotes, and even a trade show. N4a National Conference and Trade Show will be held at the Hilton New Orleans Riverside. The Florida Conference on Aging is a 3-day event presented by the Florida Council on Aging, in conjunction with the Department of Elder Affairs and the Florida Association of Aging Service Providers, organizations that educate caregivers and advocates for all Sunshine State seniors. This summer conference will be held at the Hyatt Regency Orlando. The Fourth Annual National Caregiving Conference brings together current family caregivers and those who have previously cared for a family member, as well as professionals and others with an interest in family caregiver issues. A one-of-a-kind event, it’s the only conference featuring current and former family caregivers as presenters and panelists, providing a community for the open discussion of experiences and the sharing of ideas and solutions to improve common challenges family caregivers face. This year’s theme, Our Amazing Difference, will spotlight the difference family caregivers make to those they care for, their communities, workplaces, and more. The Fourth Annual National Caregiving Conference will be held at the Chicago Marriott O’Hare, but sessions will also be broadcast virtually on November 8th and 9th. CarePartners Texas is an organization that provides continuous support to patients and family members of patients suffering from memory loss, specifically Alzheimer’s and other forms of dementia. This one-day conference will be held on the campus of Lee College in Baytown, Texas. CarePartners Texas regularly organizes similar events across the greater Houston area. For a full schedule, check the CarePartners Texas website. The Snohomish County Dementia Family Caregiver Conference is a free event that educates family members of memory loss sufferers on a variety of topics. This year’s conference has been organized to cover a total of six family caregiver-specific issues. The daylong event will be held at the Northwest Church in Lynwood, Washington. It is open to all unpaid family caregivers of dementia patients. The University of Nevada, Reno School of Medicine presents the Sanford Center for Aging Caregiver Conference, a one-day event that is tailormade for “directors, administrators, and staff of Homes for Individual Residential Care, Residential Facilities for Groups (group homes), Assisted Living Facilities, Nursing Facilities, and caregivers (both lay and professional) or others interested in the topics.” This year’s keynotes cover a vast array of topics, including facility regulations Q&As, sexuality and Alzheimer’s, positivity in caregiving, and much more. 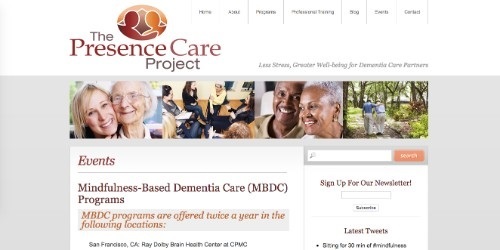 The Presence Care Project and Zen Hospice Project present 2019 Dementia Caregiver Wellness Day, an event that is specifically designed for family caregivers of adult dementia patients. The conference will introduce an array of topics, including instruction on self-care for caregivers. Each participant will be awarded a gift basket filled with items to enhance learning upon completion. Hosted by the Beth El Synagogue, Keeping the Spirit Alive – The Conference for Caregivers and Those Supporting a Loved One with Dementia is a collaboration of Jewish Family and Children’s Service of Minneapolis and Jewish Family Service of Saint Paul. The half-day event will focus in on methods to help caregivers both physically and mentally as they go about caring for a memory loss sufferer. Speakers will also provide education on evolving dementia care options for area patients. Currently in its 28th year, the Rocky Mountain Conference on Dementia, presented by the Alzheimer’s Association, is a daylong event that brings together experts and family caregivers alike in order to collaborate and educate on all things dementia-related. Patients living with Mild Cognitive Impairment are also welcome to join in as participants. This conference will be Hyatt Regency Denver Tech Center. AFTD, the Association for Frontotemporal Degeneration, is hosting its 2019 AFTD Education Conference in the spring. This Los Angeles-based event promises to be a “day filled with learning, sharing and making connections with others who understand FTD.” The presenter is currently hard at work organizing this conference. For the latest updates on agendas, event space, and scheduling, be sure to visit the AFTD website. The CurePSP Caregiver Retreat is a daylong event that features an agenda filled with self-care, nutrition, mindfulness practices, and meditation education for caregivers of loved ones suffering from neurogenerative diseases. This highly-interactive conference will be held at Texas Health Presbyterian Hospital in the spring. Held at the Radisson Narita in Tokyo, the 13th World Congress on Advances and Innovations in Dementia is a two-day event that features a series of specialized tracks, including Dementia, Alzheimer’s disease, vascular dementia, frontotemporal dementia, neurogenerative diseases, brain diseases, anxiety and depression, and more. For the full agenda and conference guide, visit the organizer’s website. 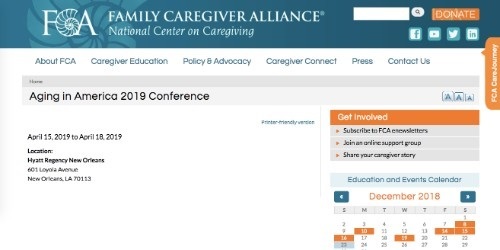 Family caregivers conference, Giving Care, Taking Care is a daylong event that provides family caregivers of dementia patients with a relevant agenda, including legal planning, mental health recommendations, educational tools, conflict resolution, and more. Giving Care, Taking Care will be held at the Tukwila Community Center. Each year, the University of Pennsylvania hosts the 2019 Caregiver Conference, an event organized by the Penn Frontotemporal Degeneration Center. This conference is specifically geared towards caregivers, family members, and friends of FTD-sufferers who are looking for support, no matter the stage of the illness. New this year are a series of breakout sessions that aim to deliver personalized information to caregivers and patients alike. Hosted at Caesar’s Palace in Las Vegas, the International Lewy Body Dementia Conference is a three-day event that bills itself as “a forum for research scientists, clinicians, and other health care professionals to share the latest information from each of their disciplines.” While a wide range of healthcare professionals are set to attend, Lewy Body Dementia patients and caregivers are also welcome to participate in the sessions. Held in Rome, Italy, the 10th Annual Conference on Dementia and Dementia Care is a two-day event organized around the theme, “Enlightening the Advancements in Dementia Research and Care.” This summer conference includes a jam-packed agenda, featuring key notes and break-out sessions organized by some of the most influential thought leaders working in the sphere of dementia research and treatment. Caregivers, both professional, as well as personal, are welcome to attend. The ALS 2019 Caregivers Conference is a winter event organized by the advocates at Rare Patient Voice, an organization that has made it its mission to help patients and caregivers voice their opinions, even in the most trying medical scenarios. This daylong conference is geared towards ALS patients and caregivers and is set to be held at the Centura College Virginia Beach Campus. Presented by the Leukemia and Lymphoma Society, 2019’s Northern California Blood Cancer Conference is an event that aims to bring together caregivers, patients, survivors, and healthcare professionals affected by blood cancer. Family members of patients are provided with a curriculum that shines on spotlight on emerging therapies, survivorship management, and various other helpful LLS resources. This conference will be held at the Hyatt Regency San Francisco. The Cholangiocarcinoma Foundation Annual Conference bills itself as being “annual program seeking to develop sustainable participation of the medical and research communities in the field of cholangiocarcinoma.” New this year is a track that specifically addresses the concerns, challenges, and options for family caregivers of cholangiocarcinoma patients. Last year’s conference boasted an impressive level of attendance, featuring a diverse set of attendees from 40 states and 12 countries. Joy Conference 2019, an annual event presented by WisconSibs, Sisters and Brothers of People with Disabilities, is open to all family caregivers. The fun-filled day is set to feature uplifting speakers that are there to motivate, reenergize, and enlighten family caregivers. This event will be held at Fox Valley Lutheran High School and includes a free lunch with registration. The TYOCD Conference & Health Fair is specifically marketed towards diabetes patients and their caregivers. The event is set to feature a wide range of programming, from health education, motivating workshops, and even a bit of humor thrown in for good measure. The Bellevue, Washington conference is held in February. For more conference location and date options, check the TYOCD website. The Care and Health Ministry of Gloria Dei, in conjunction with CarePartners, will host this year’s Gloria Dei Caregiver Conference. Once there, attendees will have the chance to partake in 18 skill-building workshops, all centered around families of Parkinson’s, diabetes, and dementia patients. This event is scheduled to be held at the Gloria Dei Lutheran Church in Houston. The Safe Patient Handling and Mobility Conference is a 5-day event that serves as the gold-standard for patient handling and mobility education. Included in this year’s program is an agenda that focuses heavily on fall prevention, hands-on practice sessions, rehabilitation guidelines, and more. Along with caregivers, this conference is set to feature a myriad of professional attendees, such as health care providers, physical therapists, risk managers, educators, and more. The Autism Alliance of Michigan is hosting this year’s Navigating Autism Today Conference, a one-day event that aims to connect caregivers, patients, and professionals within a highly-interactive forum of break-out sessions, panel discussions, and unique exhibitions. This conference will be held at Wayne County Community College – Ted Scott Campus. Formally known as the Williamsburg Conference, the Brain Injury Association of Virginia 18th Annual Conference’s theme for 2019 is “Making Headway.” The highly-specialized daylong event features a jam-packed agenda that includes sessions and keynotes hosted by some of the best and brightest in the field. This conference will be held at the Renaissance Waterfront Hotel in Portsmouth, Virginia. The 2019 Annual Ataxia Conference will serve as the 62nd installment of the yearly event. The theme of this year’s conference is “Ataxia: A Treatable Disease” and, unsurprisingly, the agenda focuses mainly on how caregivers and medical practitioners alike must re-think the way they both look at and treat this disorder. For specialized, small group sessions, be sure to attend the Birds of a Feather discussions, scheduled for Friday and Saturday afternoon. The National Down Syndrome Society will be holding its popular NDSS Adult Summit in the spring. The curriculum is geared specifically towards family caregivers of Down syndrome patients, as well as individuals, medical professionals, educators, and more. One of the main topics to be presented this year is economic self-sufficiency and employment for individuals with Down syndrome. The NDSS Adult Summit will be located at the Detroit Marriott at the Renaissance Center. Focusing on everything from legal issues to day-to-day caregiver self-care, the Hospice and Palliative Care Leadership and Advocacy Conference 2019 is a unique event that provides a holistic look into this ever-evolving medical field. Though family caregivers are welcome to attend, the agenda is geared specifically towards professional caregivers working in the hospice industry. This conference will be held at the Marriott Wardman Park Hotel in our nation’s capital. The Pennsylvania Homecare Association will be hosting its annual conference in the spring. This year’s theme is “Healthcare is Coming Home” and its agenda includes networking opportunities, a wide range of breakout sessions, and more than 60 exhibitors. Keynote speaker, Patrick Rohal, MD, will share his experience of providing care to a variety of Americans, including the Amish population. Built into the price of the ticket is two lunches, a welcome reception, and a scavenger hunt for attendees. Currently in its 23rd year, the Annual Mastocytosis Society Inc. Conference is a three-day event that features programming specifically geared towards lay-person caregivers. Organizers put a strong emphasis on patient and family caregiver advocacy, shining a spotlight on insider information, like clinical trials and other medical information to which patients and caregivers normally do not have access. This event will be held at the Crowne Plaza Hotel Foster City-San Mateo. The Klose Lymphedema Conference 2019 is a three-day event that is tailored to patients and caregivers of patients living with Lymphedema. This conference’s agenda includes a vast array of executable topics, such as wound care treatment education, early-intervention options, lymphatic surgery education, and much more. The Klose Lymphedema Conference will be held at Hyatt Regency Aurora – Denver. Rays of Hope: Survivor and Caregiver Educational Conference is exactly as the name suggests: an event that is specifically designed for brain injury survivors and caregivers. This all-day conference is set to feature advice on rehabilitation, home care, patient advocacy, and much more. The conference will take place at the Desert Willow Conference Center in Phoenix. The 2019 MHHA Annual Conference is an event that “attracts a wide variety of home health, hospice, palliative care, private duty, HME/Infusion administrators, financial officers, billers, owners, and clinicians of private, public and not-for-profit home care environments.” The conference boasts a variety of activities, along with games, an opening reception, and a non-conflicting exhibition. Inspired Breathing Conference 2019 is an event presented by the Canadian Breathe: The Lung Association. This two-day event is set to bring together a range of lung specialists, like health care professionals and respiratory experts, as well as patients and caregivers. This conference is scheduled to take place at the Saskatoon Inn. BC Care Providers Association presents the Q Factor 42nd Annual Conference, a three-day event that provides updated quality of care guidelines for caregivers, owners, and administrators working in the continuing care sector. This conference will be held at the Fairmont Hotel Whistler in British Columbia. Taking place in Chicago in the summer, the Midwest Cannabis Education Conference 2019 is a two-day event that brings together a wide range of health care professionals, patients, caregivers, and cannabis advocates. The agenda includes hot topics such as cannabis medical benefits, legal risks for prescribing/carrying cannabis, drug interactions, lab testing, autism treatment, and more. Attendees will also be able to secure CME and CEU credits upon completion of the program. This year’s theme for the Mental Health America 2019 Conference is “Dueling Diagnosis,” and it was chosen because, according to presenter, there “is a lack of uniformity across the health spectrum in how illnesses are categorized and deemed as chronic diseases and chronic conditions.” The conference consists of three days, filled with break-out sessions, insightful keynote speakers, and even an awards dinner. The 2019 Scleroderma Foundation National Patient Education Conference is the premier event for scleroderma patients as well as their family caregivers. The program contains helpful sessions, Q&As, and keynotes that address a variety of topics, such as scleroderma emotional challenges and cutting-edge therapy options. Participants will also have the opportunity to bond with other scleroderma patients and caregivers. This conference will take place at the Chicago Marriott Downtown Magnificent Mile. Presented by the Amputee Coalition, the 2019 Amputee Coalition National Conference is a three-day event that focuses on providing amputee patients as well as their medical professionals and caregivers with the latest on care and rehabilitation options. Organizers are hard at work planning this forthcoming summer conference. Check the organization’s website for updates beginning in January. The Platelet Disorder Support Association hosts the ITP Conference 2019, a three-day event being held at the Fairmont Washington, DC Georgetown. This patient and caregiver-geared conference will include educational programs, social events, and even a kids’ camp for ages 5-12, as well as a separate track for teenagers and young adults. To learn more about what to expect from this conference, watch footage from last year’s event. UOAA, the United Ostomy Associations of America, Inc., hosts the UOAA 2019 National Conference, an event that is billed as the “ostomy communities’ premier educational and social gathering.” Attendees have the chance to reap the rewards of the diverse program, which includes advice from top medical professionals, free stoma clinic Appointments WOC nurses, on and off-site social events, and support group leader networking. This conference will be held at the Philadelphia 201 Hotel in the summer. The Annual MSA Patient & Family Conference is the world’s largest patient-centric educational conference for patients of multiple system atrophy and their caregivers. The event, which has been taking place annually for the past 30 years, includes a jam-packed schedule which features talks on nutrition, practical home care strategies, movement disorder therapy, and much more. For more information on the conference’s venue, visit the MSA Coalition’s website. 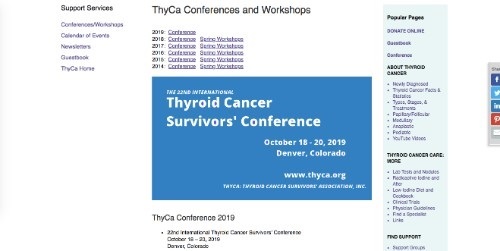 ThyCa: Thyroid Cancer Survivors’ Association, Inc. will host the ThyCa Conference 2019, an event that is currently in its 22nd year. ThyCa Conference 2019 aims to bring together thyroid cancer patients and the family caregivers connected to them. Organizers are currently working out the details of this forthcoming conference. For more information, read ThyCa’s newsletter, The Bulletin. NASDA, the National Adult Day Services Association, is set to host its annual conference at the Minneapolis Marriott City Center. The event is geared towards administrators, billers, professional caregivers, and family caregivers working in transitional care and short-term rehabilitation. To access caregiver resources prior to the conference, visit NASDA’s website. 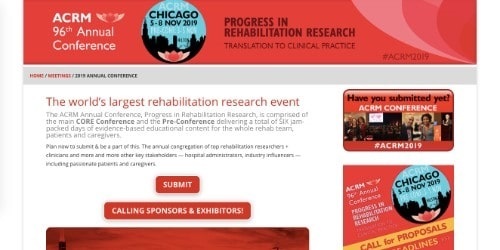 ACRM 96th Annual Conference is the world’s largest rehabilitation research event, featuring six days of “evidence-based educational content for the whole rehab team, patients, and caregivers.” This winter event will be held at the Chicago Hilton. For more information on the powerhouse presenters as their names become public, check the ACRM website.